This year, the range played host to no less than 420 competitors for the Florida Open. They came from all over the country to take part, representing 33 states, and they came from all over the world as well. Countries from as far away as Brazil and Ecuador were represented, along with the Philippines, Belgium, Germany, Spain, Puerto Rico and Jamaica. Not to be outdone – or outshot – Colombia was well represented by three members of the Bogota Police Force. 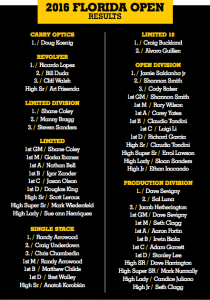 The Florida Open is the match of the year for many people; winning or even placing here is a big deal. There were 11 stages plus chrono, ten 28- to 32-round courses of fire and one all-steel stage to test everyone’s skill. Per Match Director Shannon Smith, “getting out of this match without a penalty is almost impossible,” but one shooter actually did it. Jaime Saldanha, Jr., one of the Brazilian competitors, scored an upset win over Shannon Smith, taking Open Division and High Overall! We will be seeing more of Jaime, as he plans to come back to shoot the USPSA Handgun Nationals this year at Frostproof. This past weekend, I shot in the Carry Optics division at the U.S. Practical Shooting Assn. (USPSA) Florida Open. It was a blast. Leupold Optics Hornady Safariland Smith & Wesson Corp.
VEGAS-THEMED STAGES Stage 1, called Full House, was a very challenging “shoot house.” It started with the competitor touching poker chips on a wall; some of the junior shooters had a hard time reaching the chips, but being tough competitors, they were able to manage the start like everyone else. This was a memory stage that took careful planning, as the shooting area was outside the house. If you shot all the targets as you saw them, it would cause standing reloads and multiple engagements; forgetting some targets was a costly mistake, as the FTSA (failure to shoot at) and misses could really hurt you. Stage 2 was Double Down, an unloaded start with all magazines on the barrels, while the competitor sat at a table outside the shooting area holding a cup and some cards. At the signal, competitors ran to the shooting area, grabbed their magazines, loaded and started engaging the targets, including the one underneath a blackjack table on two barrels. there was also a low target under the craps table, two quick easy alphas for most competitors; however, some people blew right past the target. This again was a costly error, with an FTSA and two Mikes. On Stage 6, Ante Up, the start was in the middle of the shooting area straddling a start stick, heels touching the rear fault line, then the competitor had to choose which of four shooting positions to run to and start engaging targets. There was one that was tricky to get into and out of quickly, but many shooters ended up there, while others ran it left to right. It was interesting to see the different strategies people used on this one; it seemed most right-handers ran to the far left and worked their way right, but the unique back-and-forth strategy used by John Ramos (3rd Limited B class) also worked well. Stage 7, Craps, had shooters holding two large dice; at the buzzer, they dropped the dice and engaged the targets from anywhere in the shooting area. Everyone I saw started in the same position rather than starting downrange and coming back up range. For Single Stack especially this was a challenging course of fire, with two targets on the right, then three on the left, while the next two positions repeated the same array; however, the fourth position had four pieces of steel at about 20 yards, and a lot of people got hung up on the right-hand piece of steel, an eight inch plate. Candice Juliano (the first lady GM in Production) went one-for-one on the steel for a good finish to a tough stage. However, one unlucky shooter wound up having to do a standing reload on the very last piece of steel – you’ve got to give him credit for not wanting to leave it up, but it hurt him in the end. Finally, in Stage 8, Roulette, the roulette balls were actually bowling balls and the start position was anywhere holding a roulette ball; competitors dropped the ball at the start signal to engage 32 targets with one shot each. The last 16 targets were behind a wall with two round ports with roulette balls in them; you had to use your body to knock them out in order to engage the targets. While the event had competitors from all over the world, there was also a strong local presence, and many of the shooters from my home club (Wyoming Antelope Club) placed well in the match, including the father-and-daughter team of Lee and Gianna Nuguit. Gianna, a 13-year-old Honor Roll student and athlete, has been shooting since she was seven but has just recently been bitten by the competitive bug. This was only the third match she’s shot with this gun; she shot the multiclassifier match at the Roads End club (as a result, she’s now a C Limited), and a couple of weeks later she turned around and shot the Florida Open against 112 Limited competitors, including seven GMs. It is good to see families come out and shoot together; besides the Nuguits, Steven Clagg shot with his son Seth and daughter Abigail (Seth took first place Master in Production), while Art Jensen, who took second place in Limited C, shot with his son Will. 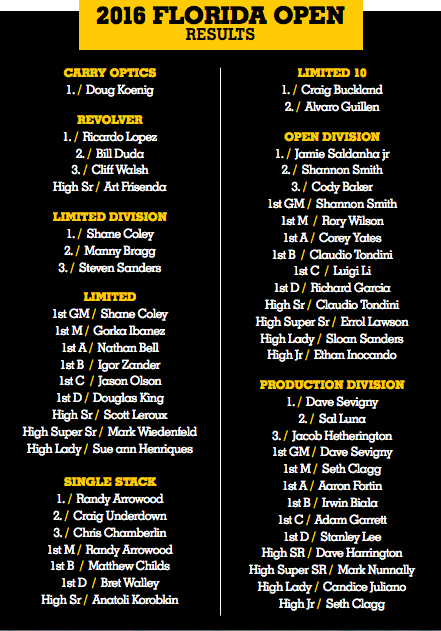 In the new Carry Optics, the legendary Doug Koenig dominated the division, taking the win by more than 400 points. He said this was the first match where he has shot his Smith & Wesson Leupold sighted Carry Optics gun. It was a pleasure to see him shoot – he had a few minor issues, but as a true champion he stayed with it. His speed and accuracy are legend; he shot Stage 1 with 28 alphas and four charlies in 25.66 seconds, and this was with three reloads. The Florida Open was a great match, running Thursday through Sunday, with the staff shooting on Thursday. Some competitors came out on Staff Day to shoot because of scheduling issues, but the majority of the match was shot Friday through Sunday. Friday was a one-day format, while the schedule for Saturday and Sunday split the stages. Some people decided to shoot the match in one day, but it was a tough schedule; the two-day format seemed to be the most popular and allowed for a more relaxed environment. We even had entertainment before the awards ceremony from Wes Dearth, an Open shooter from WAC (the Wyoming Antelope Club) who played the guitar and sang while the crowd waited for scores to post. If you haven’t shot at the Universal Shooting Academy, I highly recommend it for (mostly) great weather and year-round shooting. I hope to see you there! 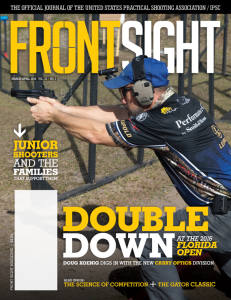 **Provided courtesy of USPSA – Front Sight March/April 2016 Issue.